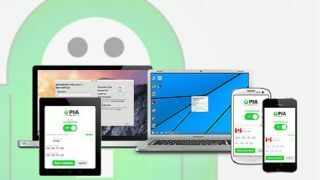 This discounted VPN is an essential tool for online protection. When you're browsing the web, you can never be too sure about who might be watching, be it your ISP, advertisers, or even the government. One of the best ways to ensure your privacy online is to use the protection of the best VPN. And this daily deal means you get two years of protection from Private Internet Access (PIA) on sale now for 63% off the retail price. Whether you're trying to avoid hackers who want to steal your information or your own ISP attempting to gather your browsing data, a VPN is an essential tool for hiding yourself from the prying eyes that are after your data. Public Wi-Fi can be dangerous, but Private Internet Access can make it safe again by providing a encrypted connection that you can connect to at any time, anywhere, on up to five devices at once. It’s an essential tool for remote workers and anyone who wants to keep their information safe while working in public. Two years of protection from Private Internet Access Usually costs $166, but you can get it on sale now for 63% off the retail price. That means you pay just $59.95 (approx. £45). It's a great deal for a necessary piece of protection to stay safe online, so grab it today.